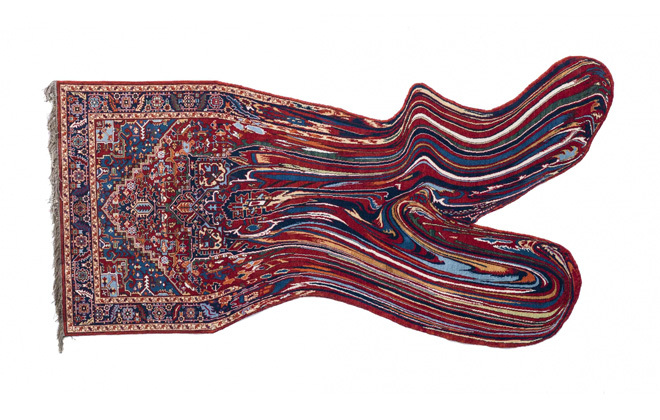 When walking into Faig Ahmed’s latest show, “Source Code” at Sapar Contemporary gallery in Tribeca, you almost can’t believe your eyes; the beautiful hand-woven carpets seem to be melting right off the wall. 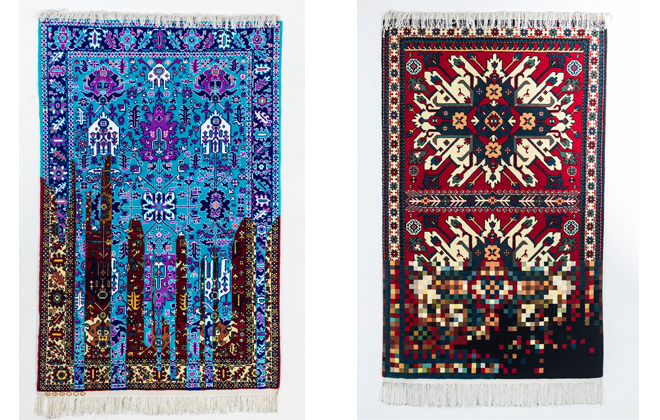 This is because the Azerbaijani artist has spent years understanding the centuries old tradition of carpet weaving, in order to manipulate and subvert that tradition into beautifully contemporary works of art. 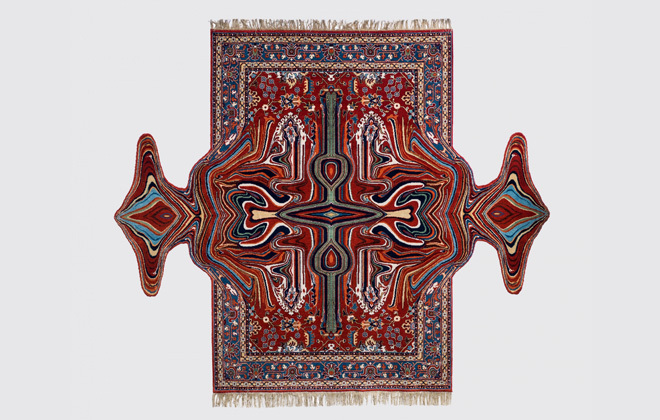 “Ahmed re-imagines carpets as a source code for visual communication, writing, design, art and even science,” says curator Nina Levent. 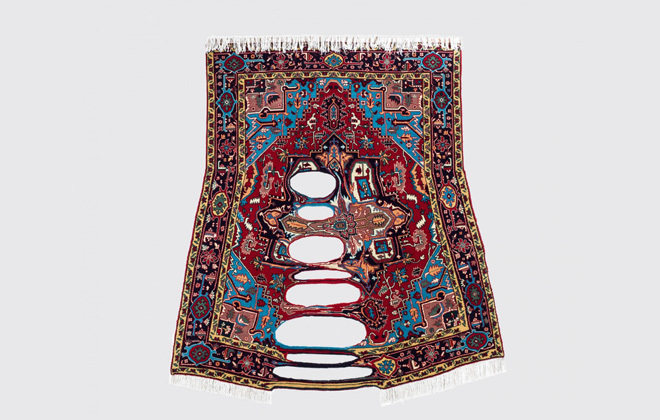 In this way, he is also reinterpreting the coded language that has been woven into traditional Azerbajani carpets for centuries, as a new contemporary language that deconstructs cultural visual codes and stereotypes. The traditional craft is crucial to these contemporary works, which is part of what makes them so powerful. 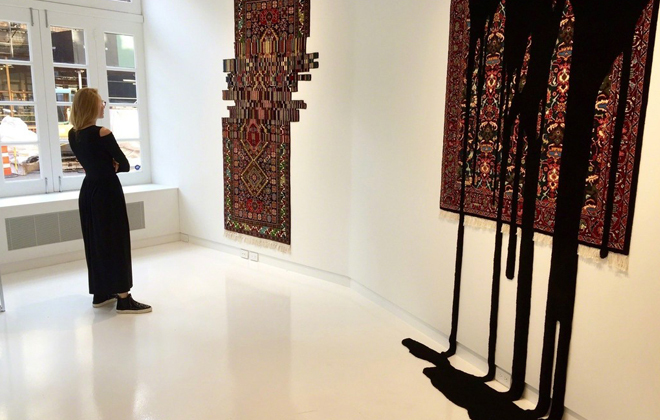 Ahmed started out by using actual centuries old carpets, which he tracked down from carpet dealers around the city. He would deconstruct the weaving in order to re-create new designs. But after realizing that these objects were instilled with so much history – history that he was not exempt from as an artist from the region – he decided to track down traditional weavers to help him recreate these traditional designs with his incorporated distortions. This proved to be easier said than done because none of the traditional weavers would touch his practically blasphemous designs. Eventually, one weaver agreed to produce Ahmed’s designs – as long as he promised to keep his identity a secret. In this way he is able to keep the entire process, from the dyes to the weaving, completely orthodox to the original technique, except for the manipulation of design. “I don’t want to change anything, but at the same time I want to change everything,” he told the New York Times. So although he is recreating these works in the traditional way, he is also incorporating contemporary elements as visual effects or glitches in the “source code” – pixelations, distortions, melting effects (all things that we usually associate with digital design), morphed onto an ancient and seemingly static physical design. “Epiphany” 2016, handwoven wool carpet, 190 x 203 cm. I could spend hours looking at these works, they are so intricate and complex, and it’s just fascinating to see how the patterns seamlessly morph from a rigid organization to a fluid motion. It is as if they are melting and transforming right before your eyes. If you are in NYC, please run as fast as you can to the Sapar Contemporary gallery as fast as you can. It will be worth your while. All photos courtesy of Sapar Contemporary and Faig Ahmed.